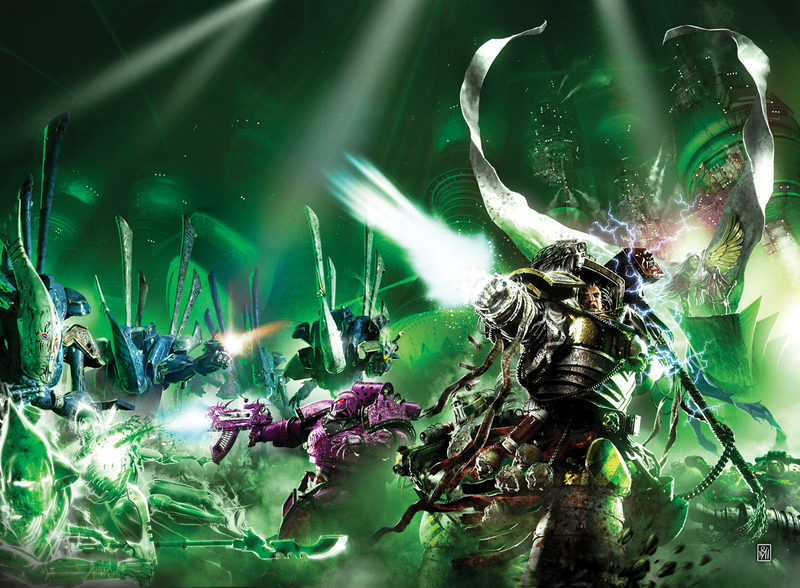 If you’re going to choose a legendary character from the history of Warhammer to write a novel about, which one springs first to mind? For me it was always Sigmar, the mythical founder of the Empire who went on to become a living god. Who else in the panoply of heroes can lay claim to that kind of honour? Sure, there are High Elf heroes that saved the world and undying necromancers who tried to end it, but when you’re already practically a god or have access to the most powerful magic in the world, it’s perhaps not all that difficult to be legendary. But when all you have is the strength in your sword arm and the fellowship of your brothers, a man has to dig deep within himself to become a hero. Sure, Sigmar has a magical warhammer, but that’s not the source of his power, it only adds to what’s already there. And that lies at the heart of what attracted me to the character of Sigmar. He was just a man. Nothing more, nothing less. Living in a land forever under the shadow of orc invasion from the east, raiders from the north and riven with tribal warfare, humankind existed on a precarious knife edge a hair’s breadth from extinction. Though Sigmar was the son of a mighty chieftain, he had none of the superlative qualities of long life, strength or skills with which many of the older races were blessed. He had something better, somethng no-one else had. He had vision. Sigmar saw that the internecine wars between the tribes would ultimately doom them. With foes in every direction, what hope could there be if every tribe counted the others as enemies? I loved this idea, and knew that there was real mileage in exploring what made a man cling to a vision no-one else could see. Overcoming the entrenched notion that the tribes would always be enemies to one another and uniting such disparate forces as the frenzied warriors of the Berserker King or the warrior women of the Asoborns under one banner would be no easy task, but Sigmar had his sights set on nothing less than an Empire of Man ruled over by a powerful Emperor. Only then would the lands of men be safe. Of course, as altruistic as this all sounds, let’s not forget that Sigmar saw himself as that Emperor, and not everyone was going to share his vision. And those that didn’t wouldn’t be welcome in his Empire… In telling the legend of Sigmar, it was immediately obvious that there was a lot of existing lore to incorporate into the novel, and I delved into the vaults of Games Workshop to uncover every morsel of information gathered in ancient issues of White Dwarf, old Army Books, role-play supplements and the like. A lot of the information I uncovered was fragmentary, contradictory or woefully out of date, but rather than seeing that as a problem, I looked at it as an opportunity. I had all this information about a heroic character who lived two and a half thousand years before the current Warhammer time period, and it was only right and proper that there would be elements of the narrative that didn’t fit neatly together. The challenge would be to tell a compelling narrative that explored the nature of a man driven to bring an entire land under his control, and do it in a way that felt realistic and worked within what we knew of him. It’s easy to write something in a broad swathe of hyperbolic description that represents incidents from thousands of years ago, but to actually write that scene in a novel, with real characters talking and interacting is quite different. This is a character about whom legends have been told and which have grown over thousands of years in the telling. Heldenhammer was the first book that came out of this, and I’d always envisaged it as a stand alone book, a telling of Sigmar’s unification of the Empire and the awesome fury of the Battle of Black Fire Pass, with a post-script at the end telling what happened to him at the end of his reign. But that’s not how it turned out, and the more I wrote of the story, the more I knew I wanted to tell stories beyond that battle. After all, winning an Empire is only half the battle, keeping it is quite another. The existing timeline for Sigmar was teasingly dotted with one line references to other battles, other trying times and other legends. I wanted to tell those stories, and thus the post-script was jettisoned from Heldenhammer, and another book was planned. That book was Empire, and it dealt with how Sigmar coped with being Emperor, and whether it lived up to his expectations. And, more importantly, how he lived up to his peoples’ expectations. After all, he’d promised them a great deal, and now it was time to live up to those promises of peace and unity. But peace and unity are not the lot of men in the Empire, and as old foes rear their head and new enemies look upon what Sigmar has built with envious eyes, war is never far beyond the horizon. Empire went on to win the David Gemmell Legend Award in 2010, which was a huge thrill for me, and an honour worthy of Sigmar himself. As I type this, I’m looking up at the axe I won, and have a warm, tingly feeling in my fingertips. In case I didn’t say it enough at the time, a huge thank you to everyone who voted for Empire. God King is the final book in this omnibus, and it deals with a collision of legendary characters, a climactic battle to the (un)death between Sigmar and Nagash. This was the tale I planned to finish with, the culmination of Sigmar’s legend where I’d finally get to use the post-script I’d written way back when I’d finished Heldenhammer. I was saying that all through the writing of God King, or at least until I realised I was leaving lots of breadcrumbs in my wake to be nibbled at later. I was setting up characters and plot lines that were just begging to be told in fresh stories, and by the time I got the Battle of the River Reik, I knew I wasn’t done with Sigmar and the post-script went back in the drawer. So, these novels are the first in what I fully expect to be an epic retelling of Sigmar’s legend, which will go on to become a fitting saga for such a mighty hero. There will be more battles fought, more blood shed, more sacrifices made and more heroism before we finally get to that post-script.